Something totally different for a Sunday morning! Silk Roots emerged from the festival band ‘The Balkan Express’ to play Eastern folk music with a sense of fun and dynamism.They see no borders and break down walls which define traditional music by fusing obscure yet beautiful melodies from various nations and continents in dance- friendly settings.Often a Ska rhythm underpins the whole and frequently the music takes off on fiddle- driven flights of fancy. When joined by the Black Peacock belly dancers a party spontaneously erupts, all divisions are banished and a spirit of freestyle unity fills the dance floor. 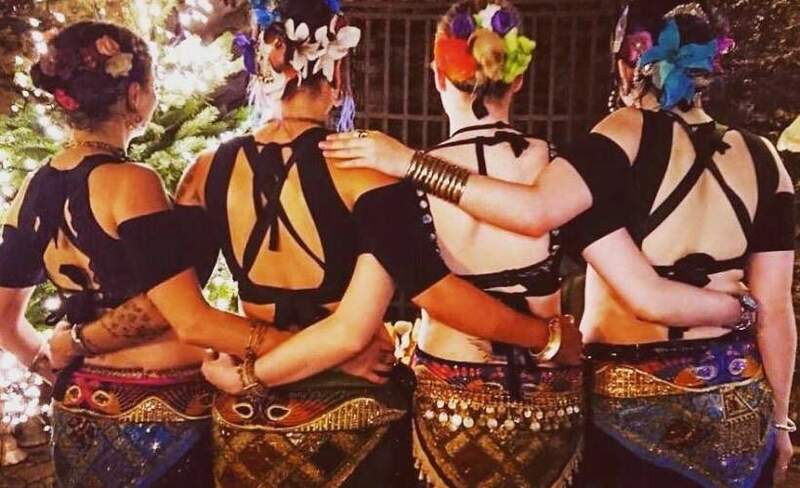 BlackPeacock BellyDance are an Improvised Tribal Style troupe from Nottingham. Based in Middle Eastern dance blended with Western dance styles, there is no choreography, but rather a language of movement which the dancers use to create a unique performance every time. We invite you to be with us in the here and now for this moment in time where we connect with the music of Silk Roots and you, the audience.